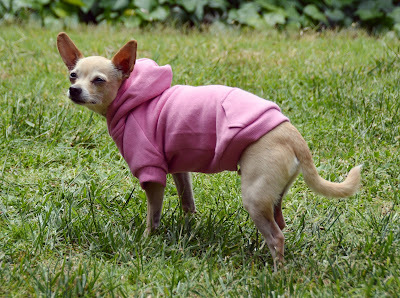 This Zack & Zoey (there is no official Zack and Zoey website) Fleece Lined Hoodie is basically the ultimate sweater for long skinny dogs. More than just a sweatshirt, it has a warm lining that makes it super thick, super warm, and super soft. This hoodie comes in plain colors that can easily be customized or embellished with paint or patches. It is available in a variety of colors and six sizes to fit dogs with chests 14-35" around. When I set out to write this review, I first went looking for the official Zack & Zoey website. I see this brand all over the place and associate it with high quality dog clothes. Obviously this must be one of those brands named for the creator's dogs, right? I was totally expecting pictures and tales of the real Zack and Zoey. Sadly, I was disappointed, and the cute names are nothing but marketing. Zack & Zoey is actually just another Pet Edge brand. Their main website only lists hoodies by Casual Canine, Guardian Gear, and Kong, but Ru's Zack & Zoey sweatshirt had the name Alpha Key on it, which led me to this Pet Edge dealer page. It turns out that Zack & Zoey is a Pet Edge brand only available to certain sellers, along with Cruising Companion, Be Good, Grriggles, Savvy Tabby, Clear Quest, UGroom, and Wise Rewards. This is why there is no official Zack & Zoey website, and the brand's online presence is limited to assorted online stores. Branding and marketing aside, I really love this sweater and Ru does too. Ru measures 13" around his chest, and 12? from the base of his neck to the base of his tail. He looks silly in a lot of short, wide clothes, and stays warmest in things that cover most of his back. This hoodie is a side small, with a chest measurement of 15" and a back length of 12", and it is absolutely perfect for Ru. I was worried he would be swimming in it but it's fluffy enough that the 3" difference between the sweater and his body works just fine. The extra large size would probably fit both Brisbane and Sisci comfortably. Pros: Super warm, super soft, super comfortable. Sized for long backs rather than wide chests. Has velcro at the neck to make it easier to get on, this also prevents it from sliding down the shoulders. Cons: It might be too warm for the impending record-setting California summer. Bottom Line: This hoodie appears to have been designed by someone who actually used it on a regular basis on actual dogs. It's a simple but thoughtful product, and I appreciate that even if the brand is actually part of a giant faceless corporation.